This snap-on peripheral provides UHF RFID functionality for the Motorola™ MC55, MC65 and MC67 terminals, capable of reading and writing to Class 1 Generation 2 (ISO 18000-6C) transponders. The device has a read range of up to 1.5m (5ft), depending on the type and number of transponders. The snap-on feature facilitates easy attachment and removal of the reader, providing a versatile mobile solution that can be deployed across both new and existing MC55/65/67 installations. The reader remains compatible with existing MC55/65/67 accessories such as the single slot cradle and car charger. 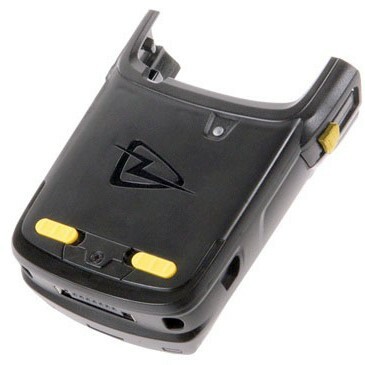 The RFID reader only draws power from its own integrated rechargeable, removable long-life Li-Polymer battery. A full SDK is available for Custom application development with support for C#/VB.NET using the Microsoft .Net development environment to provide versatile mobile solutions. The reader includes a high performance circularly polarised antenna and is suitable for operation in European (ETSI version) and US (FCC version) regulatory environments, including Dense Reader Mode. MC65 USers please note: USe of this snap-on with the MC65 requires OEM OS version 2.40.0211 or higher – please update terminal before using accessory. MC67 USers please note: Motorola have made some significant changes between the MC65 and the MC67. To use a 1119 UHF reader snap on with an MC67 reader you must be using the latest UHF reader firmware (v2.30 or higher). Please call Tel: 01442 872232 or email to sales@barcode-uk.com for more information.